Novel reduction processes utilizing the proper orthogonal decomposition method have been proposed to facilitate dual formulation of dynamic substructures. Dual formulation is significant owing to its capability of effectively solving ill-conditioned problems related to parallel-processing computers. Dual-formulation techniques employ the Lagrange multiplier method to couple substructures. In the proposed approach, substructures are reduced under constraint conditions via use of the Lagrange multiplier method, and each domain is divided into internal and interface parts—each handled separately during the reduction process. The interface to which the coupling condition is imposed is preserved without further reduction (using the internal reduction method) or reduced to a different ratio from the internal part (via internal and interface reduction technique). Once all substructures are reduced, Lagrange multipliers are applied to preserved or reduced interface parts. 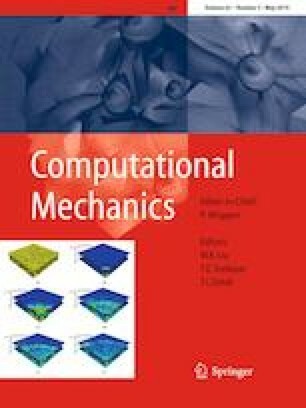 Since Boolean matrices that preserve constraint conditions are not reduced but constructed instead, the stability and accuracy of the reduced system are highly enhanced. This work was supported by the National Research Foundation (NRF) of Korea funded by the Korea government (MSIP) (Grant No. 2012R1A3A2048841).